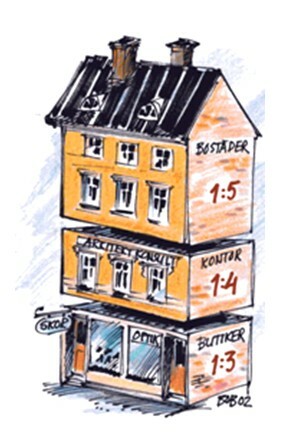 What Makes the Swedish Cadastral System so Special and Successful? 1) This paper has been prepared for presentation at the FIG Working Week in Stockholm, Sweden 14-19 June 2008. Key words: cadastral system, benchmarking, process leader, legislation. delivers real properties that are complete with different kind of attribute, like roads, sewage etc. 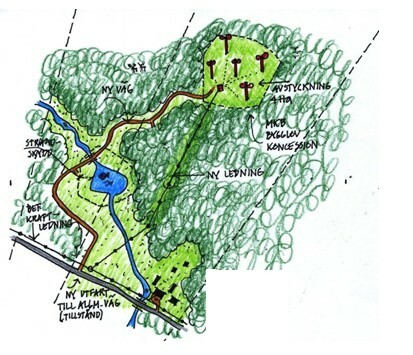 improves the division of land and ensures fragmentation of land is avoided. assures the applicant has a sustainable investment for the future. guarantees that land is managed in an efficient manner in accordance with land policies. real property division goes hand in hand with the land use. The land surveyor is responsible for the whole process and often carries out all activities himself. This makes the cadastral process easy to understand for the interested party and it alleviates the need to involve any legal experts or other consultants. The information is updated, comprehensive and well used in the society. This makes the market economy function. New, sharp, unique legislation has been introduced in the cadastral field during the last 30 years and the cadastral surveyors responsibility has extended. Although we consider the Swedish cadastral system to be successful, we also realise that there is a danger for its survival! When different benchmarking projects are comparing different aspects, it is difficult to highlight what the systems stand for and what kinds of products are delivered. Can an alternative concept, like the Swedish, survive in Europe although it is simple, smooth and successful? Benchmarking projects regarding different cadastral systems are continuously carried out. Nice reports are produced and hopefully the results can be used to encourage different organisations to improve their performances! But what are we comparing and how can we use the results from the different studies? One very comprehensive study was carried out by the Nordic countries. 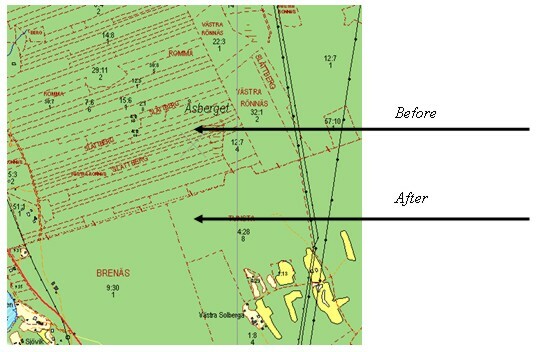 In this study the cadastral systems in the Nordic countries were described in detail. The results from the study have been documented in two reports “Dannelse og transaktioner vedrorende fast ejendom i de nordiske lande” and “Ejendomsregistering i de nordiske lande”, 2006. The findings were presented at a seminar in Copenhagen in August 2007. During this seminar I realised that, even though we often say that the Nordic cadastral systems have a lot in common, the systems do not deliver the same products! We often use the same terminology, but in fact the words do not have the same meaning - not even in the Nordic countries! During this seminar I started to look upon the Swedish cadastral system in a new way. I realised that there are a lot of important aspects in the Swedish system that I never have appreciated; they were simply a matter of course! The following describes different aspects that make the Swedish cadastral system so special and successful. 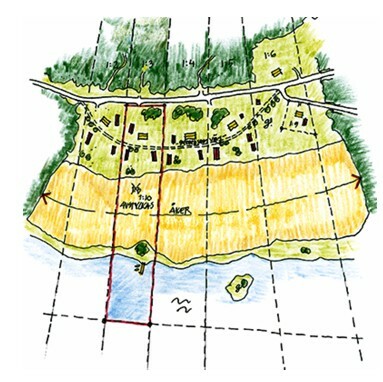 The Swedish cadastral survey history goes back to the year 1628 when the National Land Survey was established. The surveyors started the huge task to measure all land and produce maps for the whole country. Large land reforms took place with the first one starting in 1749. At this time land was fragmented and the first land reform was quite radical; the goal was to consolidate the fragmented lands of one farmer into one parcel! But time changed and strict land reforms were replaced with total freedom. The late 1800´s was a period without any land policy and with total freedom for the land owners to split and divide land as they liked! This was the period when a lot of Swedish people immigrated to USA. The authorities thought that free division of the land could make people stay in Sweden. But this was not the case. Instead the ownership of land became fragmented and the management of land quite difficult. We still suffer from the results of this era, especially in the county of Dalarna. People do not know what they own; they can not find the real property boundaries and land can not be managed in a proper way! What did we do? New legislation was introduced in 1928 and a new era with comprehensive land consolidation projects took place. Current, modern, legislation was established in 1972 and included a new land code and a real property formation act. At this time we also started to convert our Land Register and Real Property Register into digital form. 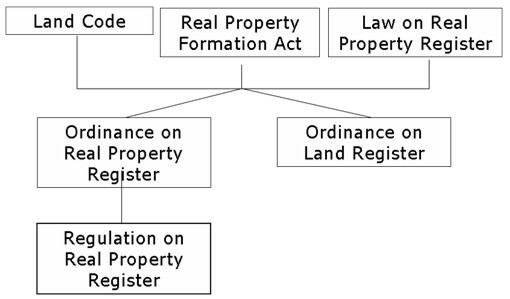 The new, modern land law and real property formation act was established 1972. Today’s law structures are modern and logic. The laws together create the play yard for the cadastral surveyor. Together with the Planning and Building Act (1987) and Act of Environment (1999) the government has created valuable instruments to implement its land policies. The Real Property Formation Act includes subdivision, consolidation, mutations, amalgamations, property determination and registration. The law is valid in both urban and rural areas. The law is powerful and it authorises the cadastral surveyor to decide about changes in the division of land, not only on a voluntary basis. The law includes compulsory purchase. Therefore, the cadastral survey process is frequently used in infrastructure project instead of time consuming expropriation processes. The Real property formation act states that a prerequisite to make any change in the property division is that the new division of land must be sustainable on a long-term basis and it must be suitable for its purpose. Otherwise it is not possible to make any change. E.g. you can create a new real property in an area with a detail plan only if it is according to the plan. E.g., a new real property meant to be used as a permanent house must have access to a road, water and sewage. Otherwise it is not sustainable on a long-term basis and not suitable for its purpose. E.g., a person wishes to buy a piece of land in order to build a summer cottage. Before the surveyor is allowed to fulfil the survey, he must make sure that there are no restrictions on the land and that there are no interests from the society. He/she must also make sure that it will be possible to get building permission. Otherwise the new real property is not sustainable on a long-term basis and not suitable for its purpose. E.g. you can split a forest unit into new real properties only if the new properties can be managed as professional forestry properties. E.g. coastal areas have special restrictions and the general public shall, as a general role, have access to the water. Therefore, a subdivision for a summerhouse can only be done in such areas as an exception. delivers real properties that are complete with different kind of attributes, like roads, sewage etc. assures the applicant a sustainable investment for the future. The banks rely upon the cadastral system and can, without any vast investigations, use the real property as a pledge. Other useful legislations were introduced in 1973; the acts of “Establishment of joint facilities”, “Formation of joint property management associations” and “Utility easement law”. Establishment of “joint facilities” and “joint property management associations” are frequently used to solve the management and administration of private roads in the country side. It is also used to manage jointly owned parking areas, garages, playgrounds, pipelines etc. E.g. 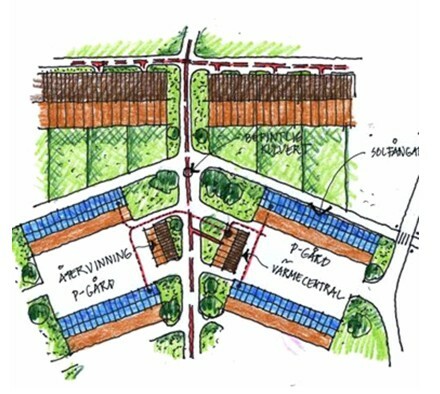 A residential area with 35 separate units jointly owns garages and a parking place. To get a sustainable management of the area, a joint facility is established, as well as a joint property management association. In this way a juristic person is established which can make decisions about the management of the construction. There is also a possibility for the association secure bank loans. According to the “Utility Easement Law” a utility easement can be created through a cadastral survey. A utility easement gives the owner of an electric pipeline access to land for constructing and managing the pipeline. The law is quite powerful and it authorises the cadastral surveyor to decide not only on a voluntary basis. The roles for economic compensation are based upon the roles of the expropriation law. The result of the cadastral survey is entered into the Real Property register and cadastral index map. In 2004, Parliament decided to introduce the possibility to create three-dimensional property units, by extending the Real Property Formation Act. Joint facilities and joint property management associations are often established to solve the management of the common constructions in three dimensional property units. There are some important restrictions in the legislation today; it is not possible to create three-dimensional property units for dwelling units! The new, non socialistic government is currently working for a change in the three-dimensional paragraphs. Next year (2009) we expect a change in the law that makes it possible to create three-dimensional property units for dwelling units. Due to the flexibility of the legislation, the same laws can be applied in simple subdivision, comprehensive land consolidation projects and infrastructure projects. Today, the cadastral surveyor gets more and more involved in infrastructure project. Access to land for railway projects can be fulfilled efficiently compared to an expropriation case handled in court. To make the projects even more beneficial, it is important to involve the cadastral survey as early as possible in the project, since access to land can be quite time consuming. Also the projects can be handled more efficiently, if the cadastral process runs parallel with the infrastructure project as the project may use information that has been produced from the cadastral survey process. Conclusion; New, sharp, unique legislation has been introduced in the cadastral field during the last 30 years and the cadastral surveyors responsibility has extended. The cadastral survey organisation has often taken different initiatives in order to achieve this. As mentioned earlier the land policies, of course, have changed through out the year. In 1970 all agriculture/farming land was protected and could not be split and a residential real property could not be larger than 1000 m². Today we have a new situation; the authorities encourage people to live in the countryside. One example of this change is the possibility to create so called “horse properties”. A “horse property” can comprise much more than 1000 m² and include agriculture land. E.g. Before the cadastral survey; One large real property consisting of agricultural and forest land. After the cadastral survey; Two separate units. One unit consists of forest land. The other real property becomes a residential real property with some agricultural land. The family living on this unit combines their ordinary jobs with raising sheep. E.g. Before the cadastral survey; one residential unit consists of 1000 m². After the cadastral survey; one unit consists of 3000 m². 2000 m² forest land has been merged into the residential real property. The forest area could not be managed by the forestry company in a professional manner and therefore it was possible to merge the land into the residential real property. Conclusion; Land policies have changed according to the demands of society. The productive forest areas are now protected at the same time as the people can get better conditions to remain in the country side. The land surveyor is responsible for the whole process and often carries out all activities himself. The Swedish cadastral surveyor has a unique role. The cadastral surveyor is authorised to make legal, economic as well as technical decisions. The decisions made by the surveyor are to be regarded as a first instance law decision. Therefore the land surveyor is employed by the state or a municipality. The surveyor is obliged to make their own investigations. During meetings, held with all concerned parties (the applicants, neighbours etc. ), the surveyor should encourage all parties to be involved in the process, aiming at finding the most beneficial solution for all (meetings are not compulsory in all cases). The surveyor must, of course, follow the intention of the laws, the land policies and regulations and he/she must consult with the municipality, the county administration board and different sector agencies like the Road Agency etc. When all concerned parties have been heard and if the investigation shows that it is possible to implement the survey, the surveyor may decide not only about the new division of land, but also about easements, economic matters and new boundaries etc. He is also responsible to secure the interests of creditors in case mortgages. He can even decide that a new sub division shall be free from mortgages (he must, of course, consider the banks interests). The surveyor must not favour anyone; the decision must be fair. The decision must consider the need of the society as well as concerned parties. Therefore, the surveyor must be totally independent. From the day when a decision is taken, any concerned party may complain to court within 4 weeks. If no one complains, the decisions are valid and the case is entered into the Real Property register. All decisions and maps are documented in a legal act and the applicant can get his/her own copy. The original document is filed at the county survey office. Nowadays all cadastral acts are in digital format and are therefore available via the Internet. If the investigation shows that it is not possible to carry out the real property formation e.g. due to a plan or a regulation, the cadastral surveyor may decide to refuse the application. The applicant may appeal this decision through courts. Conclusion; one organisation and one person is responsible for the whole cadastral process, including the registration into the Real Property register. This makes the cadastral process easy to understand for the interested party and alleviates the need to involve any legal experts or other consultants. The cadastral survey is normally an efficient process to get access to land for different purposes. Compared to cases handled in court, the cadastral survey is more rapid and cost effective. In the cadastral survey process, the land surveyor plays a much more active role than the judge in the court. The land surveyor’s role is to collect all information that is of importance for the current and future use of the proposed property. This compares with the process conducted by the court where investigations are conducted individually and the court only makes a decision based upon the information placed before it. Conclusion; The land survey process is efficient regarding delivery time as well as cost! 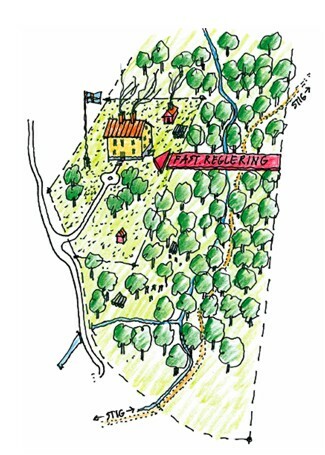 In 1976 the Real Property and Land Register in the county of Uppsala were integrated and converted and into digital format. Twenty years later all remaining registers in Sweden were converted. The Cadastral Index Map is also in digital form combined with topographic information. The system has been developed through out the year and today it is very comprehensive. The use of the system is extensive; more than 500 000 transactions are created per day! The information in the databases is continuously updated. Different organizations are involved and information is exchanged between the different organizations, like the taxation and population registers. In this way we can support the society with updated information about real property boundaries, owners (title), mortgages, addresses and taxation values of the real property etc. Different users like banks, real property market companies and brokers can make business decisions efficiently. The banks do not need to make their own investigation, they rely upon the information in the registers which means that the land owner can get his mortgage and the real estate company can make quick business! The information is used by physical planners at local and regional level and the data is used in different GIS applications. Today’s GPS and navigation system is used frequently by professionals, such as taxi drivers and transportation companies. Conclusion; The information is up to date, comprehensive, well used in the society and contributes to a well functioning market economy. 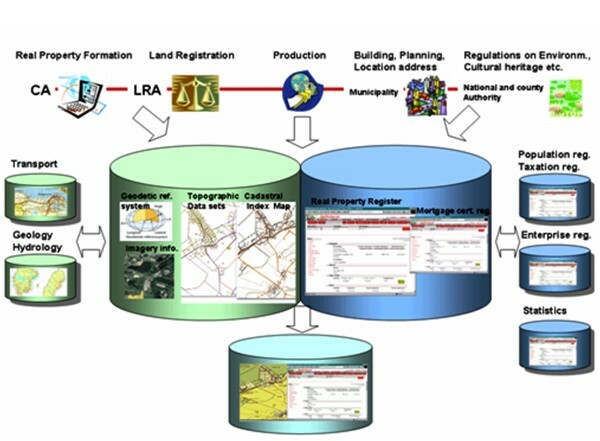 The Land Registry was merged into the Lantmateriet the 1 of June 2008! This is a great opportunity for the organisation to improve its administration, processes, and develop common web applications etc. Hopefully this will make life simpler for the customers, the general public and our selves! 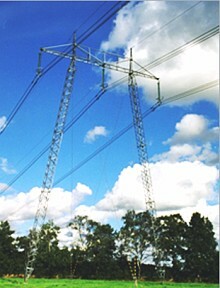 The change in the climate is a threat for all of us, but we believe the cadastral surveyor can contribute in this area in different ways such as new residential properties should not be created in potential flood areas and wind power stations can be owned by a joint facility and managed by a joint property management association etc. Although we consider the Swedish cadastral system to be successful, we also realise that there is a danger for its survival! When different benchmarking projects compare different aspects, it is difficult to highlight what the systems stand for and what kinds of products are delivered. Can an alternative concept survive in Europe although it is simple, smooth and successful? Mrs. Agneta Ericsson, born in 1950. Graduated in 1973 as M.Sc. in Land Surveying, Royal Institute of Technology, Stockholm, Sweden. Chief County Surveyor in Dalarna 1999-2007 and now Marketing Director at Lantmateriet.